A well presented detached bungalow having two bedrooms and the added incentive of ‘no upward chain’ thus helping to simplify the whole buying process. 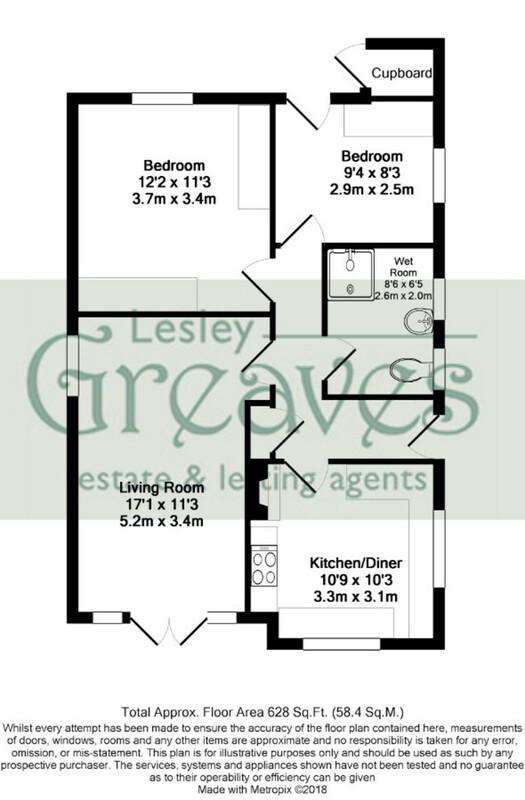 In brief the double glazed, gas centrally heated, accommodation comprises reception hallway, lounge dining room, breakfast kitchen, two bedrooms and wet room. To the outside there is a low maintenance front garden with a driveway to the side providing multi vehicle parking. To the rear is a lovely garden with a good sized deck seating area with enjoys lovely views; there is also a lawn and manageable borders. The property is in a popular, established residential area close to a wide range of amenities including schools, shops and public transport links as well as recreational and leisure facilities. An internal viewing of the property is recommended in order to appreciate both the accommodation and location; contact us now to book your personal viewing appointment. RECEPTION HALLWAY uPVC double glazed entrance door, laminate flooring, radiator, dado rail, loft access and airing cupboard housing the Worcester combination boiler. LOUNGE 17′ 0″ x 9′ 7″ (5.20m x 2.93m) plus door recess uPVC double glazed windows with inset double doors to the front, uPVC double glazed window to the side, feature fireplace and hearth with inset coal effect gas fire, radiator, dado rail, two ceiling and two wall light points. BREAKFAST KITCHEN 10′ 10″ x 10′ 3″ (3.31m x 3.14m) Fitted with a range of wall and base cupboards in high gloss white with work surfaces over, space for a cooker, one and a half bowl sink unit and drainer, tiled splashbacks, under counter space for a fridge and freezer, plumbing for a washing machine, wall mounted cooker hood, radiator, tiled floor and dual aspect uPVC double glazed windows to the front and side. 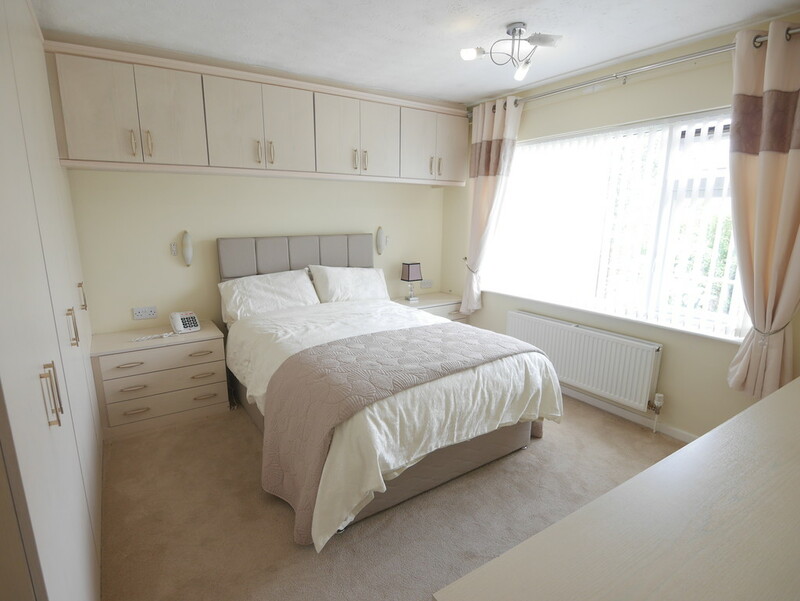 BEDROOM ONE 12′ 0″ x 11′ 6″ (3.66m x 3.51m) uPVC double glazed window to the rear, radiator and a range of fitted wardrobes, bedside drawer units and courtesy wall mounted bedside light points. BEDROOM TWO 9′ 4″ x 7′ 11″ (2.85m x 2.43m) uPVC double glazed window to the side and uPVC double glazed door to the rear garden, fitted cupboards and drawers, laminate flooring and radiator. WET ROOM 8′ 8″ x 5′ 5″ (2.66m x 1.67m) WC, pedestal wash basin, shower area fitted with an electric shower, tiled walls, radiator, extractor and two opaque uPVC double glazed windows. OUTSIDE To the front of the property is a low maintenance lawned garden with block paved driveway providing multiple vehicle parking. To the rear is a private garden with a decked seating area, lawn and low maintenance borders as well the garden enjoys far reaching views.